I've always been one to take notes in my Bible and make it colorful with highlighters and underlining. Around 20 years ago, my (then) mother-in-law and I used to send each other little stickers that we used in the margins of our Bibles. 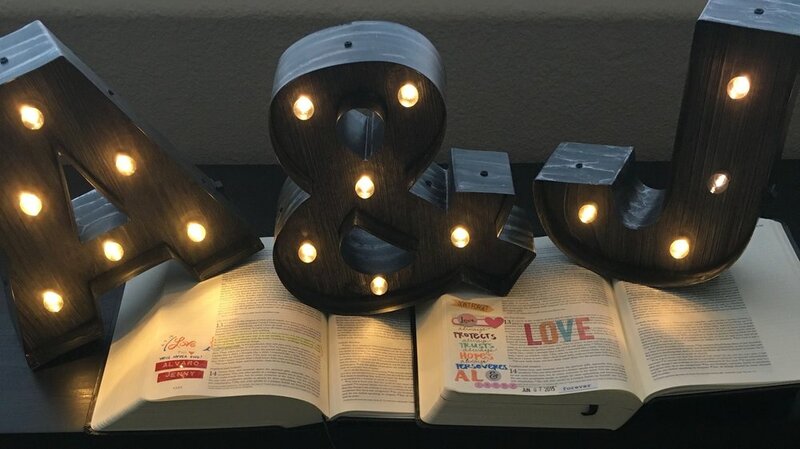 It was a fun way to connect with God's Word creatively, and made devotions more fun. Earlier this year, I began seeing social media posts about Bible journaling, and I was immediately drawn to the phenomenon. It's exciting to see the community that's developed around this creative form of worship and Bible study. I love that it combines so many interests and creative styles.. you can play with paint, stamps, stickers, markers, pens, washi tape and paper. You can embellish with drawing if that's your thing, add creative lettering, or just stick with stamps and stickers if you prefer. We ordered our journaling Bibles on Amazon, (three, because my husband and oldest daughter wanted to get in on the fun too!) but before they arrived, I started doing some creative Bible journaling in my regular study Bible. Same idea as the page I started with in my study Bible, but with more room for journaling. Illustrated Faith is a great resource, full of tips and techniques, and they have a line of stamps and stickers made specifically for Bible journaling. You can also do a search on Instagram or Pinterest and scroll through countless posts of beautiful pages people have decorated in their Bibles. I will be posting some of my pages here, as well as sharing some favorite supplies and techniques. I'll also do some prompts and have printables available. If you haven't yet, sign up for my newsletter so you'll know when they're ready for you! I'm thankful for my blended family.